"Little Rainbows has staff that is highly trained in early childhood education and has a productive curriculum for the children!" We use an enhanced version of High Scope Curriculum. The social atmosphere is recognized to be dynamic in nature. Therefore, much forethought and planning is given to vary the activities on a daily basis. Age-appropriate toys and equipment are provided. The development of fine / gross motor skills, and cognitive skills are encouraged through the use of songs, dance, music, fine arts, crafts, dramatic play, manipulative skills, and outdoor free-play. 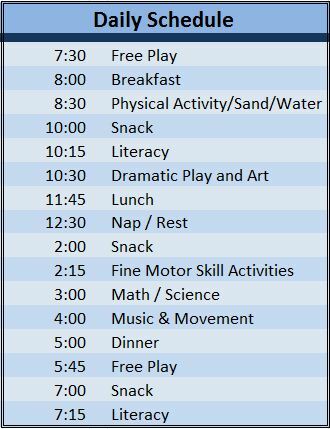 These activities are modified to be age-appropriate to serve the needs of each individual. No child is forced to participate in any activity.